Calling all squares, cool cats and outlaws! Pull on those funky threads and tear it up at the year’s most out-of-sight gig – Somewhere in Time 1969. 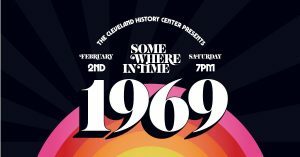 Somewhere in Time 1969 takes place this Saturday Feb 2 from 7 – 11 p.m. at the Cleveland History Center of the Western Reserve Historical Society (10825 East Boulevard Cleveland). Explore protest, revolution, and change through the sounds, grooves, duds, suds, and moves of this pivotal year in which the river burned and the eagle landed. Enjoy groovin’ music, a funkadelic open bar, cool threads costume contest and prizes, super square silent auction, delicious food and more! Ticket range from $50 – $150 and can be purchased online at https://www.wrhs.org/events/somewhere-in-time-1969/. Don’t miss this celebration of “The Year of Change”!